Cellular physiological functions are regulated via signaling mechanisms in essentially any cell type of any organ. Although myocardial cells are unique in that they are interconnected to each other with gap junctions and act as an electrical syncytium, there are nevertheless an enormous number of important cellular receptors that allow the cells to receive and respond to various signals. Many of these receptors are located on the cellular membrane. lar receptors. Nevertheless, many of the principles and mechanisms discussed in the chapter, using certain receptor subtypes as examples, are applicable to related receptor systems and should make it easier to study and understand a "new" receptor signaling system. Furthermore, a thorough review of the normal function of these receptors is important and very helpful in understanding the altered function of the same receptor systems and associated signaling mechanisms in disease states. 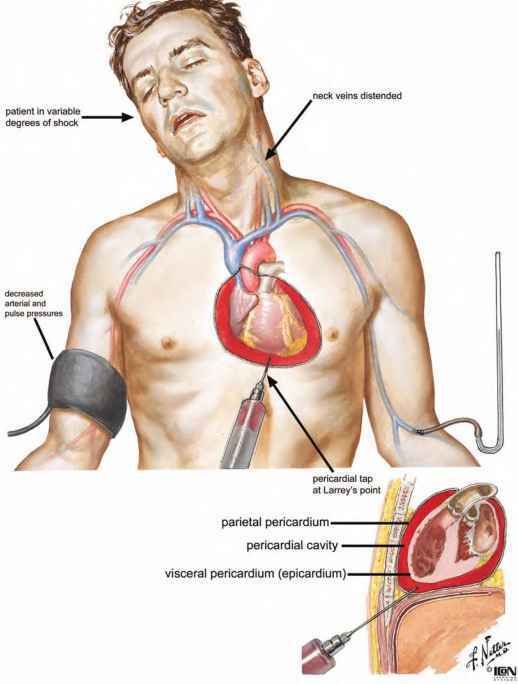 For example, how a preceptor antagonist (p-blocker, a drug that is known to depress cardiac contractility) may be beneficial in the treatment of heart failure, a state of depressed cardiac function, is reviewed. Fig. 1. G protein-receptor-coupled signaling. 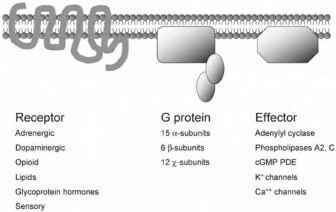 The ubiquitous seven-transmembrane receptor systems are composed of a receptor, a heterotrimeric G protein, and an effector system. The complexity of this system can be appreciated by the number of receptor types and subtypes, G protein subtypes, and different effector systems. Fig. 2. The molecular schematic structure of a ^-adrenergic receptor. Note the three main domains: extracellular, transmembrane, and cytoplasmic. The transmembrane domains are important for ligand binding. The transmembrane domain M3-7 is important in agonist binding, whereas the domains M6 and M7 are involved in antagonist binding (P-receptor blockers). The cytoplasmic domains contain important binding sites for interactions with G proteins as well as various kinases such as ^-adrenergic receptor kinase (|3-ARK). coupled receptors are reviewed, such as a-adrenergic receptors (a-ARs) and muscarinic receptors. Finally, non-G protein receptor systems, such as tyrosine-kinase-linked receptors and guanylate-cyclase-related receptors, are briefly discussed. Cell receptors allow extracellular substances to bind for regulation of intracellular function or metabolism, typically without having to enter the cell. A number of types of cellular receptors can initiate a signal that ultimately modulates cellular function. Most of the "classic" receptors are cell surface receptors, spanning the whole cell membrane and thereby allowing mediation of signals from the extracellular site to the intracellular site. The largest, and possibly most important, group is the family of G protein-coupled receptors. An attempt to classify cardiovascular receptors either by location or by receptor type is shown in Table 1. G protein-coupled receptors are functionally closely related to ion channels. The G protein-coupled receptors are part of a growing gene family identified as binding agonists such as adenosine, catecholamines, acetylcholine (ACh), light, odorants, angiotensin, histamine, opioids, and many others. Interestingly, there are several structural similarities between ion channels and G protein-coupled receptors. Both are integral membrane proteins with seven-transmembrane domains, which form bundles with a central pocket. In G proteins, the pockets are the binding sites for the receptor ligands, and they are typically located on the extracellular site of the protein; the N-terminal tail is located extracellularly as are three extracellular loops. Three loops connecting the transmembrane domains and the C-terminal domain are located intracellularly (Figs. 1 and 2). The exact functions of the extracellular loops remain largely unknown. It is considered that the transmembrane domains are involved in receptor binding. The intracellular loops, particularly loop III and the C-terminal tail, are important for receptor coupling to the associated G protein. Finally, both loop III and C-terminal tail are important for regulation of receptor function and contain phos-phorylation and other posttranslational modification sites.